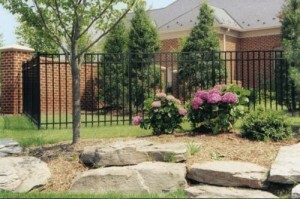 Aluminum fencing is very popular for many reasons. This type of fencing is strong and durable, but also lightweight and relatively easy to maintain. In this week’s blog, we’ll talk about the few simple steps you can take to maintain your residential aluminum fence. If there are any trees, shrubs, bushes, or other large vegetation that grow near your fence, make sure to trim them back every once in awhile. While a branch resting against the fence might not do any damage, if you don’t cut back vegetation you could have problems in the long term. Vines can overtake a fence and distort its form if left unchecked. That’s all you need to keep your fence clean. Use a mild liquid soap and some water to scrub down your fence with an old cloth, then spray it clean with the hose. Painting your aluminum fence is a fun and easy project that can give it a great new look. Look for paint that works well on aluminum, such as latex paint, and apply a new coat if it starts to fade or chip. This entry was posted on Thursday, May 1st, 2014 at 5:21 pm. Both comments and pings are currently closed.